Bruschetta is one of my all-time favorite appetizers. However, sometimes I need a break from carbs. I was trying to figure out how to get the essence of the bruschetta taste I love without using bread. Enter this greek zucchini bruschetta. 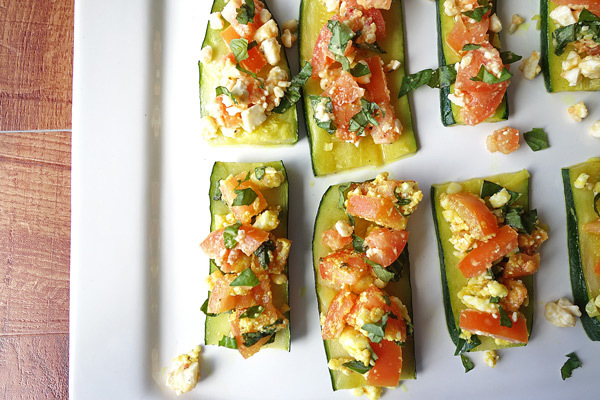 Made with Feta cheese and zucchini instead of bread, this is a fun take on an old favorite! My boyfriend and I may or may not have eaten this for lunch one day. Appetizer, lunch, whatever! This might be all I can handle after stuffing myself on Thanksgiving. Something light and healthy sounds perfect. I made this recipe with Nikos Feta crumbled tomato & basil feta cheese. It is an amazing mix of feta cheese, tomatoes, and basil. It was basically asking to be included in bruschetta. Nikos Feta has lots of different variations of feta, which you’ll see pop up in some other recipes too (peppercorn feta? Yes, please!). Feta is also lower in fat and calories than a lot of other cheeses, so I don’t feel as bad eating it. Not that I ever feel bad about eating cheese. It’s just so good! Now, back to the deliciousness that is the greek zucchini bruschetta. 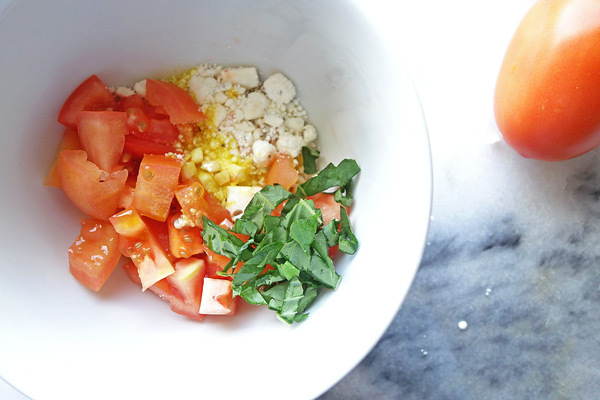 Mix the tomatoes, feta cheese, and basil in a small bowl with the olive oil and seasonings. Slice the zucchini into pieces that are about 1/3 or 1/2 inch thick. The thicker the zucchini, the easier it’ll be to top with the tomato and feta mixture. And the less messy it will be if you eat it with your hands. Do what you gotta do. Drizzle the zucchini with olive oil. I mean DRIZZLE. Don’t drench those babies because they’re going to become soggy when you bake them. Bake the zucchini until they are just about soft. Remove them from the oven and transfer to a plate or serving dish unless you want to each them right off of the pan. No judgment. Top the zucchini with the feta and tomato mixture. Once they’re all topped, serve right away! You can really eat these with the zucchini warm or cooler, but I prefer these with warm zucchini and cold tomatoes and feta. It is a magical combination. Is that too dramatic? Fine, it’s really freaking good. This post was sponsored by Nikos Feta. I received product to create this recipe. All opinions are my own. Thanks for supporting The Lawful Kitchen! 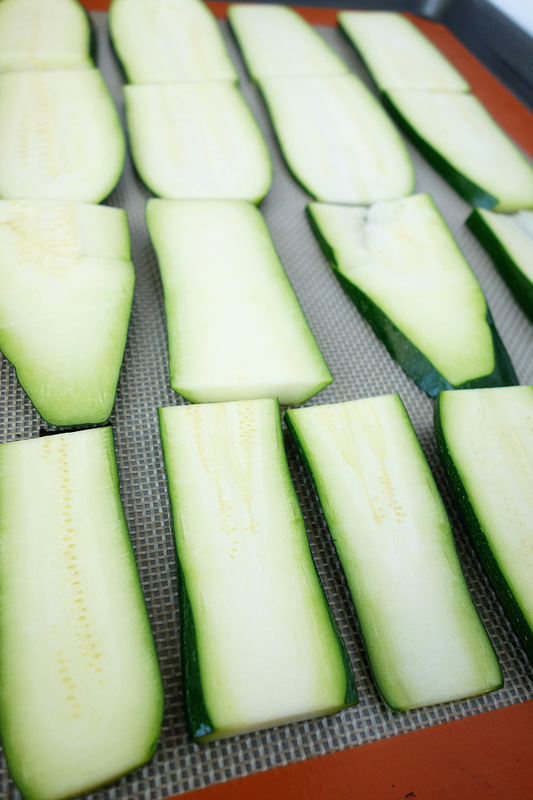 Slice zucchini into 1/3 or 1/2 inch thick pieces. Lay flat on baking sheet sprayed with nonstick cooking spray or lined with foil. Drizzle zucchini with 1 tbsp olive oil and bake in 350 degree oven until almost soft. Dice tomatoes and mix with 1 tbsp olive oil, seasonings, feta cheese, and basil. Top zucchini with tomato and feta mixture. Oh wow it looks so good!